After last week's initial teaser video, Olympus has released another video in the build-up to a big camera announcement set for January 24. We're expecting this announcement to be the much-rumored OM-D E-M1X, and in this video we get another potential glimpse of it. Like the first video, this new one is short, at just 19 seconds, and as before the footage doesn't reveal that much. 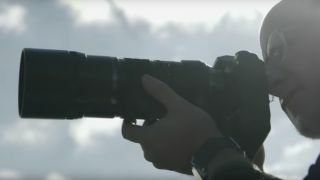 As in the previous teaser the camera is being used to capture action, this time motorsports – we think we've got the message that this is going to be a camera geared towards fast-moving action photography, although we're still in the dark about the camera's focusing prowess or burst shooting capabilities. We do get a slightly clearer view of the camera, but it's fleeting, while as before the video ends with a low-key, silhouetted shot of the camera. This time, though, we also get the briefest of glances at the rear controls of the camera. The video finishes with '24 January 2019', indicating when the camera is likely to be announced.